RECENT ITEMS Read the abstract of the paper: Vanishing Fourier transforms and generalised differences in L 2 (&Ropf;). The paper will appear in The Canadian Mathematical Bulletin. *** Read the abstract of the paper with Susumu Okada: Sharpness results concerning finite differences in Fourier analysis on the circle group. The paper has appeared in Acta Scientiarum Mathematicarum (Szeged), 84 (2018), 591-609. *** Read the paper Higher education policy and cultural change in universities. This paper will be published in the proceedings of the 2016 Annual Conference of the Independent Scholars Association of Australia. Read a review of the book by Matthew Inglis and Nina Attridge: Does Mathematical Study Develop Logical Thinking? Testing the Theory of Formal Discipline. The review appeared in the Gazette of the Australian Mathematical Society, volume 44, no.3, July 2017. View recent photos from two Australian national parks: Dorrigo National Park, New South Wales and Lamington National Park, Queensland. View also photos from the Yacaaba Headland area near Hawk's Nest, New South Wales. generalised differences in L 2 (-π,π) appeared in the Journal of Mathematical Analysis and Applications, vol.455 (2017), pp.1425-1443. Read an abstract of this paper. You may also read a short slide presentation of this paper. The graph above illustrates a function of the type x ⟼ ( cos x - cos n x ) 2 , and such functions are important in obtaining the results of this paper. *** The paper A comparison of two types of bank investments was published in The Australian Senior Mathematics Journal, volume 31 (2017), pp.5-18. The analysis is a comparison of two types of compound interest investment. The main aim is to establish the time at which the second type of investment becomes superior to the first, thus assisting in investment decision making. Read about the Slovak-Australian mathematician Igor Kluvánek, and read some of his quotations. Also,you may read a paper given in Badin, Slovakia, at the conference "The University: place of meeting and confrontation between faith and reason" held in September 2011. Read about Richard Dawkins and the God hypothesis. Read about the research-teaching nexus. Leading-edge your objectives -- read a (rather unorthodox) submission to the Bradley enquiry on universities. *** The year 2012 was the bicentenary of the birth of the celebrated English writer Charles Dickens (d. 1870). Go to the Charles Dickens Page to read about his life and work. Read about pentagons and the golden ratio, and the irrationality of the square root of five. Read about an elegant result in Fourier analysis of Gary H. Meisters and Wolfgang M. Schmidt. To read a description of the result at undergraduate level, click here. 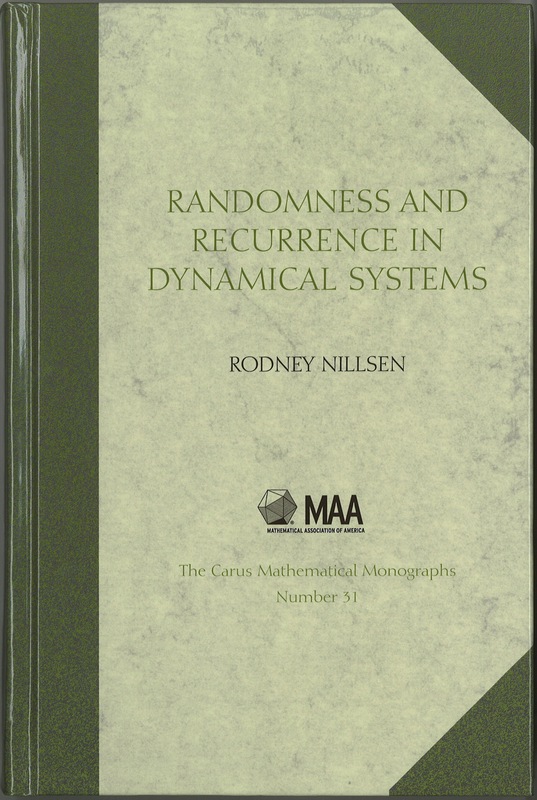 The book Randomness and Recurrence in Dynamical Systems was published by the Mathematical Association of America in 2010. Read a review of this book by David Hand. Also, you may read more about this book.